Keep Coming Back - by Winning a Lifetime of Grand Strand Vacations! The Myrtle Beach area’s impressive lineup of family-friendly attractions, along with its mild coastal climate and 60-plus miles of stunning beaches, can certainly provide the vacation of a lifetime — just ask the thousands of vacationers who make return visits to the Carolina coast each year. Now, you can win a seven-night Myrtle Beach vacation at Bay View on the Boardwalk — and keep coming back for life! 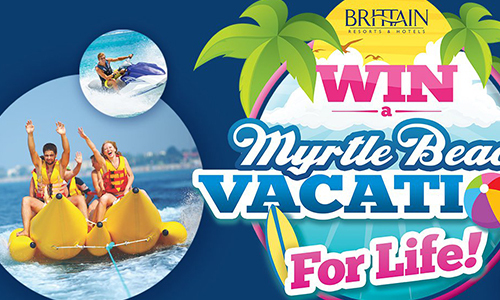 The Myrtle Beach Vacation for Life contest will see one lucky Grand Prize winner claim an annual, seven-night, four-person vacation at Bay View on the Boardwalk – or at his or her choice from the numerous other Brittain Resorts & Hotels properties in the area. This gives the big winner a range of accommodation options to choose from, as the Brittain Resorts & Hotels property list includes 10-plus Myrtle Beach-area resorts consisting of more than 3,500 rooms, suites and condos, 30 on-site restaurants and bars, and 130 pools and lazy rivers. If the winner prefers, he or she can instead opt to collect a one-time, $10,000 cash prize. Imagine returning each year to Bay View on the Boardwalk’s beautiful oceanfront property right on the 1.2-mile Myrtle Beach Boardwalk in the heart of downtown Myrtle Beach. One vacation after another, you and your family can splash around our indoor pool and hot tub, relax and go with the flow in our indoor lazy river, and take the kids to play in the on-site kiddie pool and oceanfront splash deck. Plus, you can enjoy the delicious food and drinks found at our on-site Starbucks location. Don’t forget, of course, that all of these amenities, as well as your comfortable accommodations, will be located within steps of the Atlantic Ocean and right on the Boardwalk, whose wooden walkway leads to numerous downtown attractions. Making the contest even more exciting, the winning isn’t limited to the Grand Prize. Four more lucky winners will each claim a one-time, seven-night Myrtle Beach area vacation at a Brittain Resorts & Hotels property of their choice. The resort-choice possibilities include (of course) Bay View on the Boardwalk, as well as North Beach Plantation, The Cottages at North Beach Plantation, Ocean Reef Resort, The Strand Resort, Long Bay Resort, The Caribbean Resort & Villas, Dayton House Resort, The Breakers Resort, Paradise Resort and Compass Cove Resort. We’d be thrilled to have you and your family become recognized regulars at Bay View on the Boardwalk. To enter the Myrtle Beach Vacation for Life contest, simply fill out and submit the entry form found here. Once you’ve entered, watch the official contest video found here to get yourself revved up and ready for the lifetime of vacations that could be in your family’s future. At Bay View on the Boardwalk, we’ve grown accustomed to hearing guests say they had the time of their lives on the Grand Strand. Now we want you and your loved ones to have the time of your life — over and over again each year — with our Myrtle Beach Vacation for Life contest. Enter today!